In 2012, St. John’s celebrated our 50th Anniversary of ministry in the community!! On November 18, 1962, the charter members of St. John’s gathered for the first time for worship at the Richboro Elementary School on Second Street Pike. The group grew quickly in spirit and in numbers! 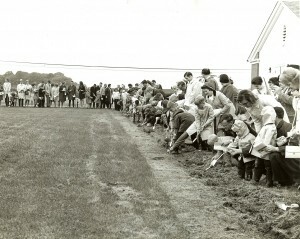 Within two years, land was purchased and construction had begun on Almshouse Road! 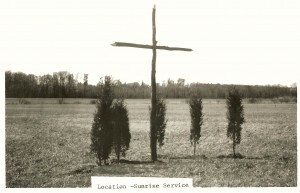 As an announcement of the upcoming church, a crude cross constructed from two cedar trees, cut and stripped of their branches, was erected on the site. Soon thereafter, Easter sunrise services were held on the vacant lot. Those who came were surprised to see the cross, once bare, had sprouted new life! Surely this was a sign of God’s promise for the new St. John’s. Rev. John Carter led the congregation for the first fifteen years of growing pains. He led the building campaign in two waves. 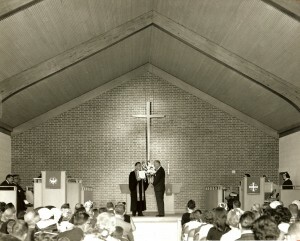 In 1964, the sanctuary (now Fellowship Hall), kitchen, and a few classrooms were built. In 1971, with more space needed, the current sanctuary, parlor, and suite of offices were added. Then, in 1988, the back wing of classrooms was completed. The church has continued to flourish as Rev. Thomas Hallam held the pulpit (1973-1992), followed by Rev. J. Dennis Williams (1992-1996), Rev. William Thompson (1996-2008), and currently Rev. Janice A. Puliti. Currently, an average of over 420 persons worship on any given Sunday at one of St. John’s three worship services, and over 1100 adults call St. John’s their church home. We are truly God’s people called to grow and serve!